The murder of Judge Hugo Jackson is out of Detective Simon Ziele's jurisdiction in more ways than one. For one, its high-profile enough to command the attention of the police commissioner. The judge was presiding over the trial of Al Drayson, an anarchist, who set off a bomb at a Carnegie wedding, but instead of killing millionaires, it killed passersby, including a child. The trial has captured the attention of 1906 New York City. Furthermore, Simon's precinct doesn't include Gramercy Park, which is where the judge is found in his town house with his throat slashed. But his widow insists on calling her husband's old classmate criminologist, Alistair Sinclair, who in turn enlists Ziele. Together they must steer Sinclair's methods past a police force that is focused on rounding up Drayson's supporters and have all but rejected any other possibilities. 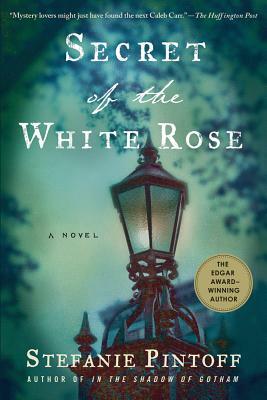 Edgar Award–winning author Stefanie Pintoff's combination of a fascinating case and the sometimes-brutal and sometimes-glittering history of turn-of-the-century New York in this stellar historical makes Secret of the White Rose an utterly compelling read. Stefanie Pintoff is the author of A Curtain Falls, In the Shadow of Gotham, and Secret of the White Rose. In the Shadow of Gotham is the winner of the 2010 Edgar Award for Best First Novel and the Washington Irving Book Prize, and she has earned nominations for the Agatha, Anthony and Macavity Awards. She is also a graduate of Columbia University Law School and has a Ph.D. in literature from New York University. Now a full-time writer, she lives with her husband and daughter on Manhattan’s Upper West Side.